So needless to say, having them in town was refreshing and needed. We spent a lot of time showing them around Charlotte and meeting up with a mutual friend who goes to grad school in the area. It was such a fun weekend, but one of the best parts was having Jess take our pictures. Jess got a new camera for her birthday and brought it on their trip so that she could get some pictures of me and Taylor, some headshots for the blog, etc. I was a little worried we wouldn't get one's that I liked for the blog, simply because I hate how I look in pictures since gaining weight. It's easy to get caught up in the world's standard of beauty: to like people better when they are attractive, to think of thin people as a "higher class" than heavy people, and to see physical imperfections as dividers. I do it, and I'm willing to bet you do too to some degree. But we know that's not right. We know that our physical appearance does not determine our worth, or the the truth about our inward beauty. God see's us as His beautiful creations. 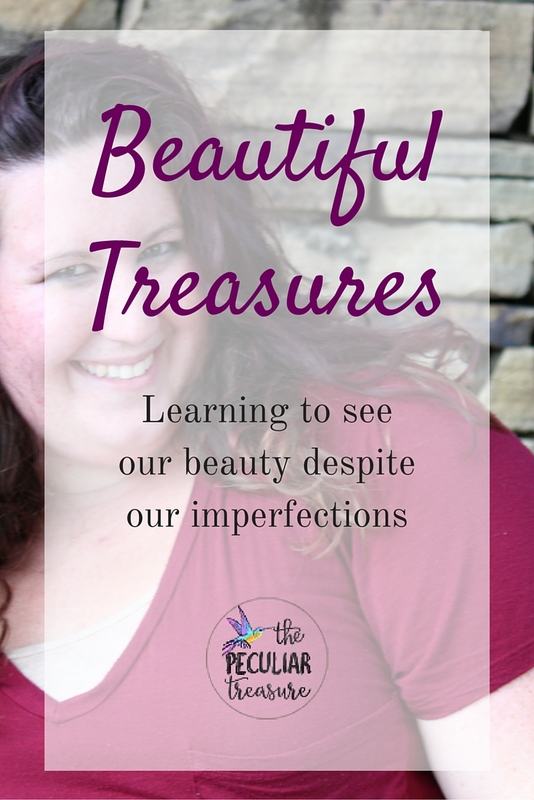 Sure, our flaws are there, but the beauty is there too- inside and out! This is technically still "Mug-spiration Monday", but I'd like to encourage you all to take this Monday's encouragement a little further. I challenge you to post a selfie on Instagram today using the hashtag "#thebeautifultreasures". Let everyone know that you are beautiful despite whatever imperfections you may have. Make the world a little bit better today by encouraging others to see themselves as the lovely people they are. I'm so glad it encouraged you! You are a beautiful woman, Kristin, i'm so glad you are learning to celebrate it! Thank you, sweet friend! You are too! This photoshoot looks like so much fun! I love this positive outlook on overlooking your perceived flaws and focusing on inner beauty too! We all need so much more of this! Thank you, Rachel! I appreciate that a lot! Lovely photos! That raspberry color is stunning on you! Definitely your color! Thanks for posting. Everyone needs to hear this! You are beautiful! I love getting together with friends we haven't seen for a while. You can have the best of times. Too many of us avoid pictures because we don't like the way we look - especially in pictures. I know I have been guilty of this! Love this post! It's inspired me to write something like this for my readers as well. Everyone needs encouragement from time to time to find beauty in themselves. Thanks for sharing! Haha, that's a great point, Candy!